Beginning page of the 'Dedication' of Il Campo Marzio dell'Antica Roma in Latin. Beginning page of the 'Dedication' of Il Campo Marzio dell'Antica Roma in Italian. A rendering of the sarcophagus of Maria appears within the Il Campo Marzio dell'Antica Roma publication as head-piece to the Latin dedication the publication to Robert Adam. This position makes the sarcophagus of Maria the third image within Il Campo Marzio after the title page and the frontispiece. Did Piranesi deliberately place ancient Rome's last imperial artifact at the very beginning of his documentation? Moreover, is it significant that the sarcophagus of Maria is the only ancient remain depicted within Il Campo Marzio that is Christian as opposed to Pagan? 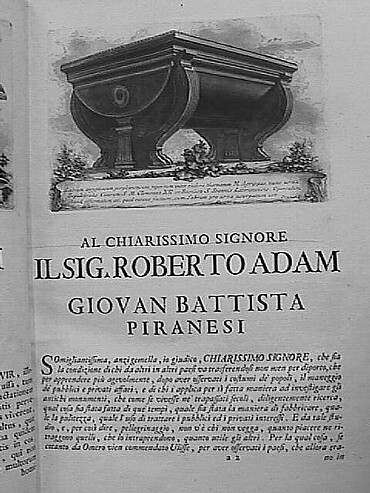 Interestingly, a "sarcophagus of Egyptian porphyry found among the ruins of the baths of Agrippa, now the funerary urn for the ashes of Pope Clement XII [1730-40] in the Basilica of St. John Lateran" acts as head-piece to Il Campo Marzio's Italian dedication to Robert Adam. Signs of ancient Rome's Pagan-Christian inversion. The only sketches which have reached us represent a few perfume bottles found inside the grave. Of these flacons there are two sets of drawings, one in a codex of marchese Raffaelli di Cingoli, f.43, with the legend, "Five goblets of agate discovered in the foundations of S. Peter's during the pontificate of Paul III. in the tomb of Maria, daughter of Stilicho and wife of Honorius;" the other in the codex of Fulvio Orsino, No. 3439 of the Vatican Library. The discovery took place in 1544. A greater treasure of gems, gold, and precious objects has never been found in a single tomb. The beautiful empress was lying in a coffin of red granite, clothed in a state robe woven of gold. Of the same material were the veil, and the shroud which covered the head and breast. The melting of these materials produced a considerable amount of pure gold, its weight being variously stated at thirty-five or forty pounds. Bullinger puts it at eighty, with manifest exaggeration. At the right of the body was placed a casket of solid silver, full of goblets and smelling-bottles, cut in rock crystal, agate, and other precious stones. There were thirty in all, among which were two cups, one round, one oval, decorated with figures in high relief, of exquisite taste, and a lamp, made of gold and crystal, in the shape of a corrugated sea-shell, the hole for the oil being protected and concealed by a golden fly, which moved around a socket. There were also four golden vases, one of which was studded with gems. In a second casket of gilded silver, placed at the left side, were found one hundred and fifty objects, — gold rings with engraved stones, earrings, brooches, necklaces, buttons, hair-pins, etc. covered with emeralds, pearls, and sapphires; a golden nut, which opened in halves; a bulla which has been published in a special work by Mazzucchelli; and an emerald engraved with the bust of Honorius, valued at five hundred ducats. Silver objects were scarce; of these we find mentioned only a hairpin and a buckle of repoussé work. The letters and names engraved on some pieces prove that they formed the mundus muliebris (wedding gifts) and toilet articles of Maria, Daughter of Stilicho and Serena, sister of Thermantia and Eucherius, and wife of the emperor Honorius. Besides the names of the four archangels — Raphael, Gabriel, Michael and Uriel — engraved on a band of gold, those of Domina Nostra Maria, and of Dominus Noster Honorius, were seen on other objects. The bulla was inscribed with the names of Honorius, Maria, Stilicho, Serena, Thermantia, and Eucherius, radiating in the form of a double cross with the exclamation "Vivatis!" between them. With the exception of this bulla, which was bought by Marchese Trivulzio of Milan, at the beginning of the present century, every article has disappeared. That the gold was melted, and that the precious stones were disposed of in various ways, so as to deprive them of their identity, is easy to understand, but where have the vases gone? Were it not for the rough sketches made at the time of the discovery we should not be able to form an idea of their beauty and elegance of shape. They were not the work of goldsmiths of the fifth century, but were of classical origin; in fact they represent a portion of the imperial state jewels, which Honorius had inherited from his predecessors, and which he had offered to Maria on her wedding day. Claudianus, the court poet, described them expressly as having sparkled on the breast and forehead of empresses in bygone days. We know from Paul Diaconus that Honorius was laid to rest by the side his empress; his coffin, however, has never been found. It must still be concealed under the pavement of the modern church at the southern end of the transept, near the altar of the crucifixion of S. Peter. Rodolfo Lanciani, Pagan and Christian Rome (New York: Houghton, Mifflin and Company, 1892), p. 203-205. ...to learn more of Honorius (the younger son of Theodosius who is now Emperor of the West) and his wife Maria. Honorius was the last ancient ruler to [re]build the walls of Rome (because of the "Gothic Wars" -- Christian "Goths" that is) and he also built an imperial mausoleum attached to the original Basilica of St. Peter's. Sometime in the 1500s the sarcophagus of Maria was discovered (very likely while the old basilica was being demolished to make way for the new/present one). 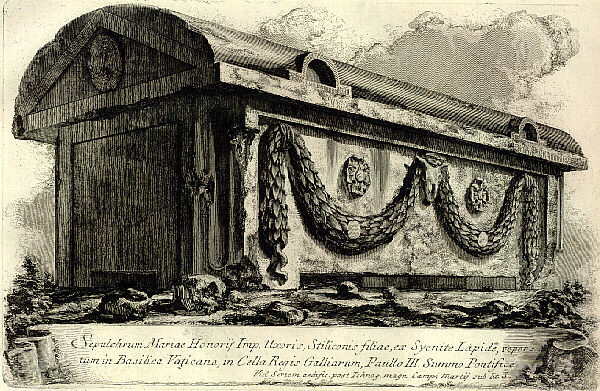 The sarcophagus of Maria may well be the last substantial imperial artifact of (the city of) Rome, and after an illustrious title page and a frontispiece, it is an image of the sarcophagus of Maria that Piranesi uses to begin his Campo Marzio publication. 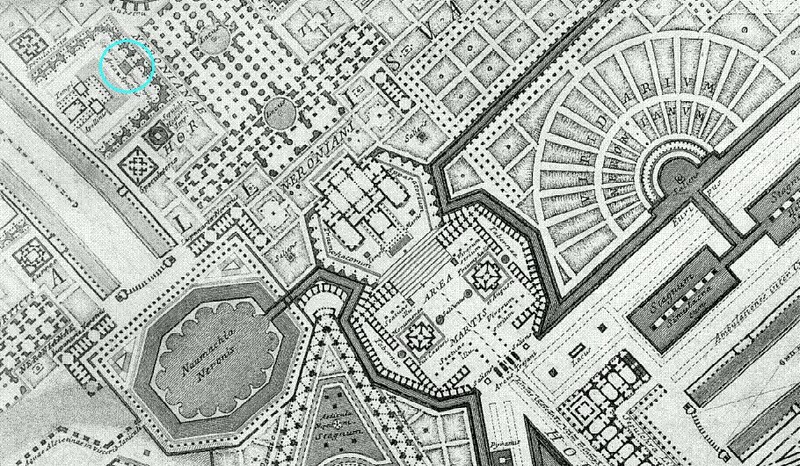 In a most elegantly covert way, Piranesi began the 'history' of the Campo Marzio with what is really it's ending, and what is probably the world's greatest designed architectural inversionary double theater goes on from there. ...like the fore and aft of Finnegan's Wake or the role of Sepulchrum Mariae Honorij Imp. Uxoris, Stiliconis filiae within Il Campo Marzio. Burial of the sarcophagus containing the remains of Maria, the first wife of the Emperor Honorius, occurred circa 400 AD within the Mausoleum of Honorius, a structure then newly attached to the south transept of the original Basilica of Saint Peter. Honorius built his mausoleum c.400 for himself and his family. It attached directly to the south transept of St. Peter's Basilica, and was next to a pagan aristocratic tomb of the third century. The practice of attaching burial mausolea-chapels to major shrines was not unusual during late antiquity and early medieval times. In the middle of the eighth century, Popes Stephen II (752-7) and Paul I (757-67) took over the Mausoleum of Honorius, and converted it into the church of St. Petronilla. During the sixteenth century, the mausoleum, along with the original St. Peter's, was destroyed to make way for the present basilica. 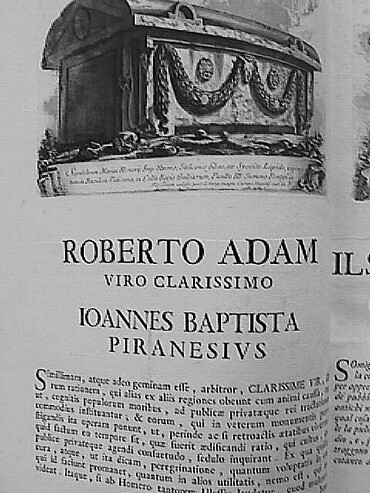 A rendering of the sarcophagus of Maria appears within the 1762 edition of Piranesi's Il Campo Marzio dell'Antica Roma, specifically as head-piece of the Latin dedication of the publication to Robert Adam. This position makes the sarcophagus of Maria the third image within Il Campo Marzio after the title page and the frontispiece. 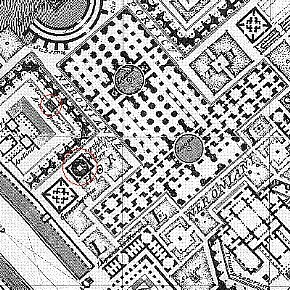 Did Piranesi deliberately place ancient Rome's last imperial artifact at the very beginning of his documentation? Moreover, is it significant that the sarcophagus of Maria is the only ancient remain depicted within Il Campo Marzio that is Christian as opposed to Pagan? 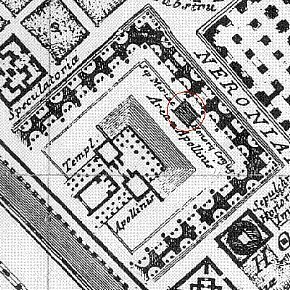 Maria, wife of the emperor Honorius, appears a second time within Piranesi's Il Campo Marzio in the "Ichnographia Campus Martii", the large fold-out plan where Piranesi reenacts ancient Rome's Campo Marzio and its environs, although in this instance, it is the sepulcher of Maria that is delineated rather than her sarcophagus. Although the Basilica of St. Peter's is absent from the "Ichnographia Campus Martius", the sepulchers of Maria and Honorius are nonetheless in close proximity to a basilican shaped building, namely the Porticus Neronianae whose specific shape is that of a Latin cross. 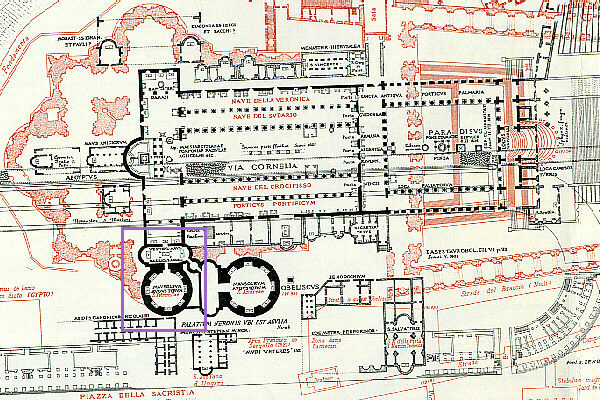 Furthermore, a superimposition of the Ichnographia's Garden of Nero with Nolli's plan of St. Peter's Basilica and Square registered in exact scale and location, renders the Porticus Neronianae as an inversion of the real St. Peter's, hence the presence of a Christian entity within the Ichnographia is again covert in its disclosure and likewise a product of inversion. Ultimately, the Porticus Neronianae exhibits its full hidden meaning when the plan of the porticus and the plan of St. Peter's are superimposed at the same scale directly atop each other.